Home > Tips & Articles > Articles > What is a Bar Mitzvah? Bar Mitzvah, what is it, why, and when? What does one do on this day and what makes it so important? Is this the age of maturity and awareness? Is there an obligation to be called to the Torah on this day? Can it be celebrated earlier or delayed? Where is all this written? How do we know that this is the appropriate age? At thirteen years of age plus one day, every Jewish man takes upon himself the obligation of observance of the mitzvot (laws) of the Torah. Up until then, although he practices the laws, observance is not compulsory. He spends time learning the mitzvot, but the obligation to perform them does not exist until one day after his thirteenth birthday. The first compulsory mitzvah that he fulfills is the shema, recited during arvit (the evening prayer). The following morning at dawn, he performs his second obligation, the laying of tefillin. 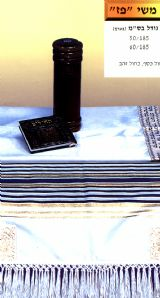 It is customary for the bar mitzvah (of thirteen years and a day) to read from the Torah, on any day the Torah is read (Monday, Thursday or Shabbat). On Shabbat, the bar mitzvah can also read the haftarah. All this is arranged by someone familiar with the rituals. Where is this written? How do we know that this is the proper age? There is no mention of this in the Torah. Instead, the tradition was passed down from Moshe Rabeinu (our teacher) at Sinai. In the Mishna tractate Avot, chapter five verse 21, it says: Hu’ Hayah Omer, Ben Hamesh Shanim LaMiqra’, Ben ‘Eser LaMishnah, Ben Shelosh ‘Esreh LaMiswot (He (Yehuda ben Taima) used to say,at five [one should begin the study of] Scriptures; at ten, Mishna; at thirteen [one becomes obligated in] the commandments). Bar mitzvah is a term that symbolizes the day that the young man begins his full association with the adult Jewish community, and is able to join the minyan (quorum of ten for prayers). It signifies the moment when he begins his personal responsibility to Hashem. Please note that the term Bar Mitzvah does not mean the “possessor of the mitzvot” but rather a “son of the mitzvot,” confirming that the bar mitzvah is a link in a chain that began at Sinai, a connection between father and son that can never be severed. The tremendous joy at this time is no less than the joy experienced at birth. For thirteen years, we have nurtured a young plant; now we are beginning to see, with Hashem’s help, not only its flowers but its fruits. We have a celebration to thank Hashem for his help and to offer our blessings and prayers that the bar mitzvah continues to progress, and bring nachat to his family and the entire community. The sages said: “One who is commanded to do something and then performs it is greater than one who is not”. In other words, one who is obligated to do a mitzvah and acts upon this obligation is considered on a higher level than one who “volunteers” to do it. This seems counterintuitive: one would think that voluntary fulfillment is preferable, yet our sages declare the contrary, explaining that we receive obligations if we merit them. Thus, the source of our happiness for the bar mitzvah is the fact that he now merits the undertaking of his obligations as a Jew. The main part of the simcha (celebration) is on the actual birthday. This is the simcha shel mitzvah. It is customary for the bar mitzvah to be called to the Torah. Where and when? As stated above, the child does not join the quorum and is not considered part of the adult community until the day after his thirteenth birthday (according to the Hebrew date). A party can precede the birthday but, as noted above, the bar mitzvah may only join the minyan after his thirteenth birthday (according to the Hebrew calendar), and not before. It is worthwhile to point out that we do not find a directive, mitzvah, passed down from generation to generation implying the bar mitzvah ceremony: it is a custom. In any case, it is permissible to celebrate, or to deliver a dvar Torah (Torah speech) after the actual birthday. In order to fulfill the mitzvah of laying tefillin, it is important to invest in proper kosher tefillin, as elaborated in the chapter “Tips for buying tefillin” and in our article in the STAM Column. There is no obligation to arrange an expensive party and/ or to take loans for this purpose. When the boy is called to the Torah, a short dvar Torah by the bar mitzvah, followed by a small convocation for the family with light refreshments is sufficient. You can find an assortment of bar mitzvah speeches on our site. If you wish a personalized speech, tailored to your needs, please contact us and we will prepare one that will fit (the bar mitzvah boy and/ or his parents) perfectly.